SHORTLY BEFORE CHRISTMAS LAST YEAR, I pulled the Coyote Cafe’s first cookbook from my library shelves. Published in 1990, it was written by Mark Miller, the founder, creative force, and initial chef of this pioneering Santa Fe restaurant. The book still resonates with its thoughtful and lively updates of classic foods of the Southwest. I wanted to refresh my memory on how to whip up some scrumptious little corn cakes with smoky chipotle shrimp. The recipe has often appeared on my table at the holidays, but just as often in the spring, summer, and fall. In leafing through the book, I was reminded that the Coyote Cafe opened in Santa Fe 30 years ago, an eternity in the restaurant world. Miller sold it some years ago to concentrate on consulting internationally, but his legacy has perhaps never been stronger. Others have noticed this, too. “I think New Mexico had its moment like 25 years ago, when Southwestern food was just becoming an important thing in this country, and now it’s having a comeback,” star chef and restaurateur Bobby Flay recently told Food & Wine magazine. Flay made his initial splash at his New York City Mesa Grill, serving a menu of Southwestern foods we’d all recognize, thanks in part to Miller’s popular reinvention of our classic flavors. But part of Miller’s enduring influence also comes from the way he trained a second wave of kitchen masters to further the mission. I first encountered Miller’s culinary mastery back in the 1980s, when I had a job that regularly took me to the Bay Area. On those trips, I methodically arranged to dine at the up-and-coming—and, in some cases, already arrived—restaurants of the day. I heard about this New England guy named Mark Miller who was helming the Fourth Street Grill, in Berkeley, with some intri-guing Southwestern dishes. When word spread that Miller was coming to Santa Fe to open a restaurant called the Coyote Cafe, I could not have been more thrilled. I first met him not in his restaurant in Berkeley or in Santa Fe, but waiting for a Los Angeles hotel elevator. I timidly spoke up about being a fan of his cooking and he told me he was in town for a star-studded Meals on Wheels event. He didn’t know me from a chair in that hotel lobby, but I have an amber-encased memory of his evangelism on behalf of New Mexico and its chiles. There was some grousing at the time, among home cooks and restaurant chefs alike, over the fact that this dude from Boston via Berkeley had started cooking in Santa Fe with traditional ingredients in some new (and old) ways and had won a tsunami of national press for it. The contretemps flared for years, but ultimately it missed the point: Because of Miller’s ability to communicate with the greater world, he helped fuel that moment when Southwestern food swept the nation. It isn’t hard to trace the culinary DNA of Santa Fe’s foodie family tree. Many of those who absorbed early lessons from Miller went on to influence the landscape in powerful ways. An early chef de cuisine at Coyote, Jeff Koscomb, went on to found Above Sea Level, a premier purveyor of quality seafood to restaurants throughout northern New Mexico. Coyote front-of-the-house manager Greg O’Byrne used his experience to land a job as executive director of the Santa Fe Wine & Chile Fiesta, which has grown to international prominence over more than two decades. Line cook Murphy O’Brien had a successful run managing the late, great Mu Du Noodles before founding his wildly popular Café Fina. Miller’s corporate executive pastry chef Andrew MacLauchlan wrote several noted books, including The Making of a Pastry Chef. 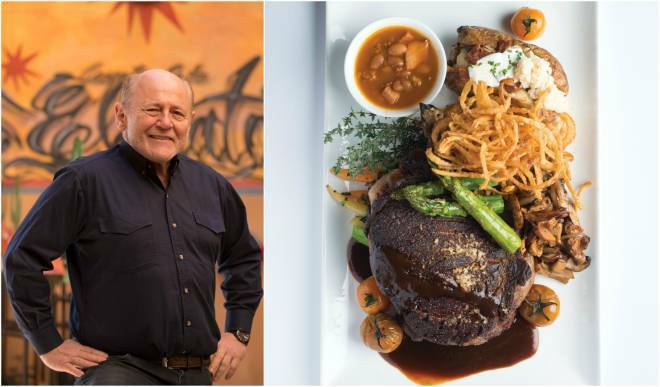 He now oversees breads, pastries, and other desserts in a quartet of kitchens for the New Mexico Fine Dining group, which includes Bouche Bistro, Maize, Trattoria a Mano, and what will become a new incarnation of the Bobcat Bite on Old Las Vegas Highway. Other Coyote veterans continued in Miller’s footsteps, further elevating and evolving the concept of Santa Fe cuisine. Mark Kiffin, chef-owner of the Compound, in Santa Fe, came to New Mexico initially to audition with Miller, who needed someone to take over the Coyote kitchen while he and his chef de cuisine hit the road on an extended tour for the Coyote Cafe cookbook. Kiffin had to come from his job at the Arizona Biltmore for a tryout, first cooking on the kitchen’s line. After surviving that literal trial by fire, Miller gave him an eight-page essay exam. Kiffin aced it and went on to helm the kitchen, then took charge of Coyote special projects. Coyote’s Pantry, The Great Salsa Book, and Mark Miller’s Indian Market Cookbook were authored jointly by the two Marks. Kiffin also played major roles in the opening of other Miller restaurants in Washington, D.C., and Las Vegas, Nevada. In a sense, I’m a Miller acolyte, too. When I started to write about outdoor cooking in the mid-1990s—some years after I saw him by that elevator—Miller shared his expertise in wood-fired grilling, as a traditional form of Southwestern and Mexican cooking and as a restaurant technique. One New Year’s Day, I invited him over for lunch. I thought about the lessons I had learned from him on cooking techniques and how my own love for bold-flavored food was not unlike his. I decided to make a Mexican crab stew called a chimpachole or chilpachole, which starts with a base of fire-roasted tomatoes and chipotle chiles. He may not even remember the experience now, but at the time he talked about how I nailed it for him. I have never forgotten those lessons.